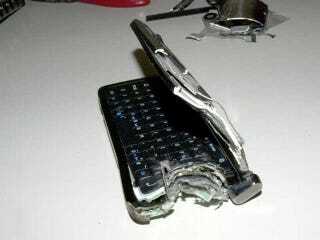 Someone blasted their Nokia E90 with a 12-bore shotgun. And then decided to put the bent and twisted piece of telephony up for sale on eBay "for parts." Or for laughs, because then someone decided to buy the remains of the smartphone for $20.50. Apparently, he didn't realize that not a single part of this phone would work, as the E90 is mostly a single sandwich of printed circuit boards. Gunshot gallery is below.